As Tim will testify we're both blessed with wives who are fully supportive in our hobbies, In Tims picture Linda has spread her weight across a rather wide section of baseboard which would never have taken Tims weight and has started the filling in of trees etc to hide the electrical sockets on the back wall, A week ago my wife, Natalia, wad taking her first steps in soldering under-board droppers in places I can no longer reach. I should have rescued her but not before I took a picture. Any ideas what she is doing? I liked the Quote "but not before I took a picture" I thought you were about to say "but not before she's finished the job"
The Bachmann/TMC horse box is simply stunning but at £24 it should be. Sorry that I have not provide an update for a couple of days - I have been very busy. Hopefully, I have something quite spectacular to share for the next update, it will be something quite large. For those who are reading this as a result of a link published elsewhere - the reason for my appearance on MRL was not my choice. However my presence on MRL has been very positive in terms of personal satisfaction, my thanks to those who forced my removal. Now that is a tree, just another few more to make. 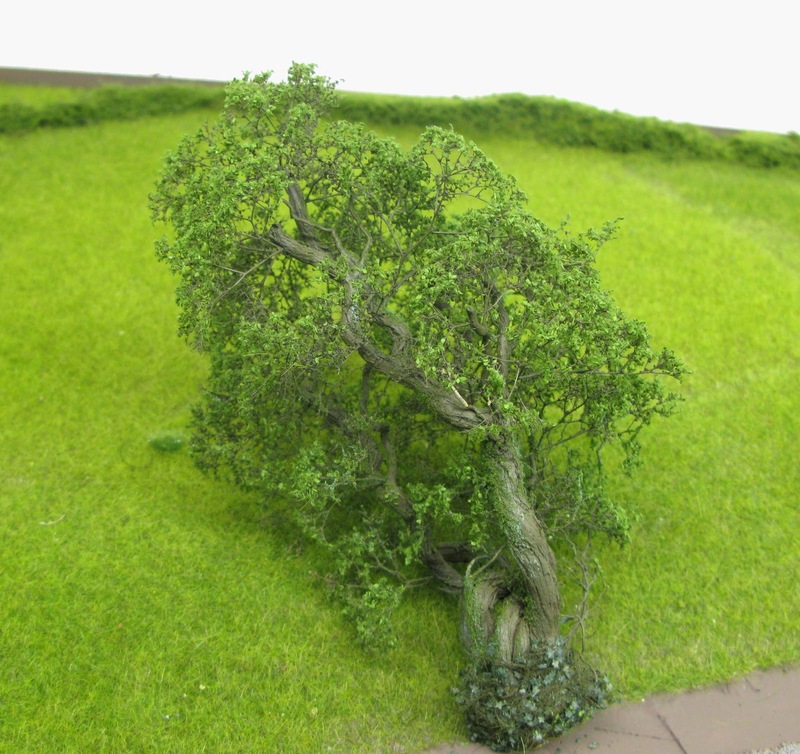 Not all my trees are so spectacular, I prefer to use 'bog-brush' trees for view blocks but hide their origins by making nice trunks and hiding them behind handbuilt trees - what I really need is the impression of a small wood rather than individual examples. But this one is a beauty. Tree-mendous! Stunning tree you have there Tim. May I ask how long it took to make it? 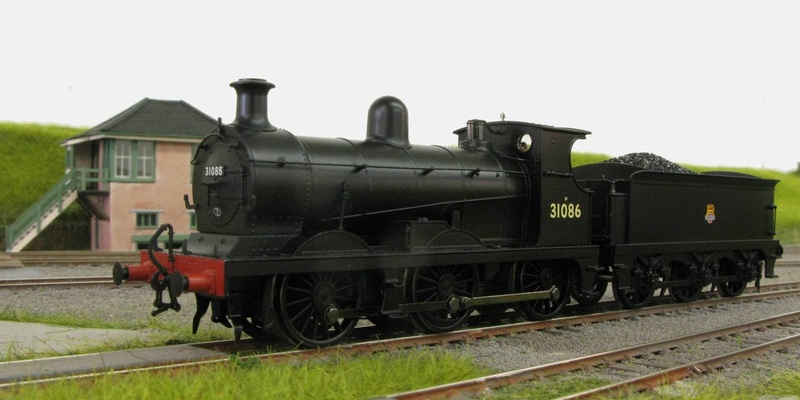 Dugald Drummond designed a series of 4-6-0 locomotives, but none was particularly successful, so when he designed in 1911 what was to be his last class, to some surprise a 4-4-0 emerged from Eastleigh workshops in February 1912, the first of his D15 class. Contrary to his 4-6-0 designs, the D15s performed exceptionally well and were put to work on the Bournemouth run where, apparently, many drivers preferred them to the T14 4-6-0s as they used less coal, water and oil and were quicker and easier to prepare and dispose. This is a very fine example of the D15, it runs well and is built to a very high standard. lovely looking loco . don't think i can get away with one in a staffordshire based layout! dam !!! Now sold and looking forward to its replacement. 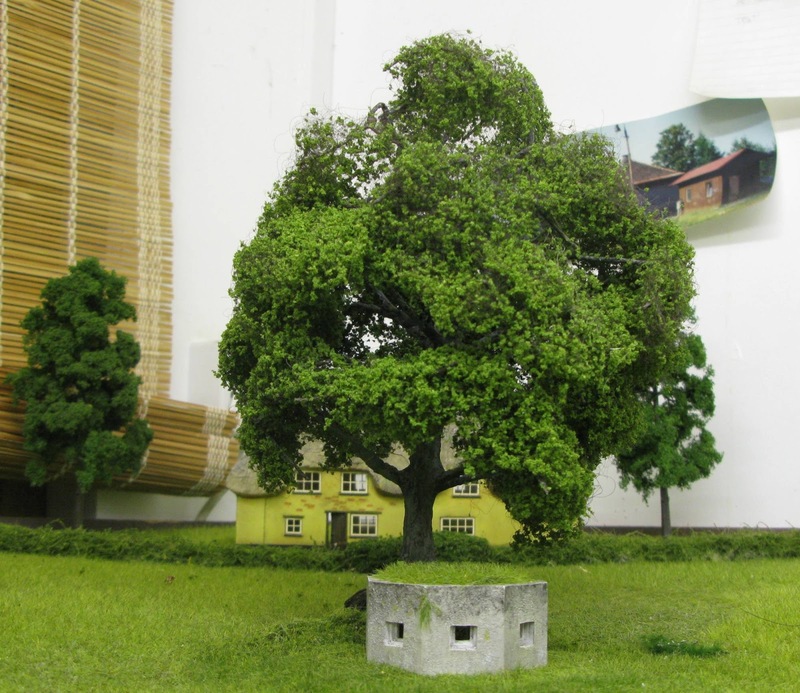 Using some of the techniques in Gordon Gravett's book but mostly adapted from other sources, this tree is based on organic materials rather than a wire frame. It stands about 20cms and looks just like the trees alongside the line at Wayford. Wow... and I mean WOW! That's one good looking tree! That is a fantastic tree! I'd love to know how it what made, or more specifically which 'organic material' was used for the trunk and branches? Christmas has brought a Southern goods loco, albeit a foreigner, but still a Southern loco and a delightful model. The connection is the C-Class was the only steam loco that I remember on the Hayes branch that run past our home in West Wickham. The local service served the suburban community in and out of London, Charing Cross and was operated by 2-Bils whilst the local coal merchant received his supplies hauled by a C-Class. West Wickham is a leafy part of Bromley and provided happy memories of Mister Polly written by Bromley author HG Wells. At least one member of the forum will recognise this domestic scene, Bill Jones, made this lovely washing line and here it is on Beaminster Road. Many of Bill's details have found a new home, not least on my layout where they are a tribute to Bill's skill as a modeller. Not sure how this works, hopefully you click on the link. 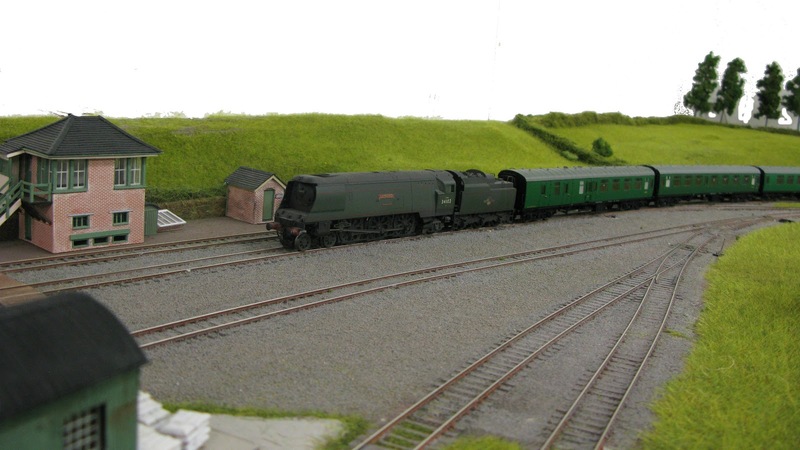 It is Hornby 34102 Lapford ruuning around Beaminster Road hauling a rake of Bachmann's finest Mk1 and a BR horse box. Great work and will we be expecting more Clips from you...? Had a most enjoyable visit to Beaminster Road. The layout is looking very nice indeed, and we had a good time examining the various locos, watching trains and discussing Southern modelling. Those new trees are absolutey stunning. Tea and mince pies were most refreshing, thanks very much for your hospitality Tim. Two Bachmann N's running light on Beaminster Road. I am getting the hang of this mini-cam, the next trick is to pan and zoom.